The rare-earth elements (REEs) are considered as some of the most critical elements in the EU and the USA today. E-scrap, such as end-of-life neodymium magnets, could be a viable secondary source for the recovery of these elements. Neodymium magnets (NdFeB) consist of considerable amounts of Nd, Dy, Pr, and some other REEs, depending on the specific application. Apart from REEs, neodymium magnets are made up of around 60% iron, which can pose a challenge in their recycling. For example, iron can be dissolved along with other elements during leaching or co-extracted during solvent extraction. In this work, extraction of REEs with TODGA (tetraoctyl-diglycolamide) from a real leachate, obtained by neodymium magnet powder dissolution in nitric acid, was studied. The goal was to selectively extract the REEs from other elements in the solution. TODGA was used as the extracting agent due to its selective extraction properties for REEs and other f-block elements. The influence of the diluent on the overall extraction and the selectivity of the extraction was studied in order to determine application feasibility of future processes. To this end, experiments using Solvent 70 (hydrocarbons C11–C14, ≤0.5 wt% aromatics), hexane, toluene, cyclohexanone and 1-octanol as the diluents were performed. TODGA has shown good selectivity between REEs and other elements in solution under almost all conditions, reaching the highest distribution ratios of REEs in the aliphatic diluents, while the distribution ratios of other non-REEs reach a mere value of 0.1. An exception was cyclohexanone, which has the ability to extract small amounts of ions itself. The highest separation factors between Dy and the light REEs (Nd and Pr) were observed with a 0.01 M solution of TODGA in Solvent 70. REEs, as group, were extracted with 0.1 M solutions of TODGA in all diluents except for cyclohexanone, which led to extraction of Al and B at amounts greater than 10%. Stripping with over 98% efficiency was achieved using MQ water in one step. Rare-earth elements (REEs) have become of great importance to today’s society by virtue of their being vital components in many areas of advancement. Due to their unique properties, they have been used in magnetism, spectroscopy, catalysis, and other areas of human endeavor. In particular, they have been used to create permanent magnet alloys (NdFeB—neodymium magnets and SmCo—samarium cobalt permanent magnets). They are also used in processes such as petroleum refining. Over the past couple of decades, around 95% of the world’s demand for REEs was provided by China, which led to increased prices and supply risk after the global financial crisis of 2011 . They are, up to this day, classified as the elements with the highest supply risk within the EU , with the heavy REE elements being at highest supply risk. Taking this into consideration, the idea of recycling REEs out of the existing end-of-life products gained popularity, especially in the EU and the United States. Some of these sources are the electric, electronic, and other waste materials such as permanent magnets (NdFeB—neodymium magnets and SmCo—samarium cobalt permanent magnets), lamp phosphors, and NiMH batteries . NdFeB permanent magnets are currently used in hard disk drives (HDDs), motors in hybrid cars, wind turbines, and MRI machines, among others. Their consumption has increased dramatically in recent decades . Recycling can help reduce fluctuations of prices by reducing the potential for monopolies, even if recycling cannot totally replace the supply of REEs from mines. Less than 1% of the REEs were recycled by 2011 , and no data have been provided on the development of new large-scale processes. The scarcity of data on the quantity of REE materials from magnets in the waste streams and the fate of the magnets after shredding has handicapped the development of REE recycling processes . One route by which the REEs can be recovered from magnets is hydrometallurgical in nature. Ideally, in the recycling process, selective dissolution of the rare-earths (and the valuable boron), except iron, would occur. It was shown that this was not easily achievable, since unwanted elements (for instance nickel and copper from the protective coating of the magnets) went into the solution when the magnets were leached with nitric acid . Therefore, the present study was focused on the selective extraction of the REEs from the leachate obtained from the liquor obtained by digesting the NdFeB magnet waste using nitric acid. Various diluents used together with the selected extractant, TODGA (tetraoctyl-diglycolamide) (Fig. 1), were tested to study their effects on the extraction, and the possible effects on selectivity of the extraction in order to achieve a pure REEs stream for further reprocessing, and to see if it is possible to achieve any selectivity between the heavy Dy and the light Nd and Pr. To date, a number of extracting agents have been developed, such as di-(2-ethylhexyl) phosphoric acid (D2EHPA), 2-ethylhexylphosphoric acid mono (2-ethylhexyl) ester (P507), tri-n-butylphosphate (TBP), Cyanex923 (a mixture of straight chain alkylated phosphine oxides), di-(1-methylheptyl) methyl phosphate (P350), and amines and carboxylic acids (CA100). These have been widely utilized in industry for the solvent extraction separation of REEs . The extracting agents mentioned have some disadvantages, such as poor selectivity, poor stripping of the metals from the organic phase, and a low rate of extraction. Moreover, few of the rare-earth extraction agents currently used in industry follow the CHON principle, meaning it is not possible to incinerate them without either the production of ash or acidic gases (nitrogen oxides are ignored) . A promising extractant that complies with the CHNO principle and could be used for the extraction of REEs out of the leachate formed from NdFeB magnet waste is TODGA (N, N, N′, N′-tetraoctyl-diglycolamide). This molecule has previously shown good extraction properties of lanthanides and actinides when extracted from highly acidic solutions [8, 9]. It has also been found that the loading capacity of 0.1 M TODGA-n-dodecane is 0.008 M Nd(III) with an aqueous phase of 3 M HNO3 . 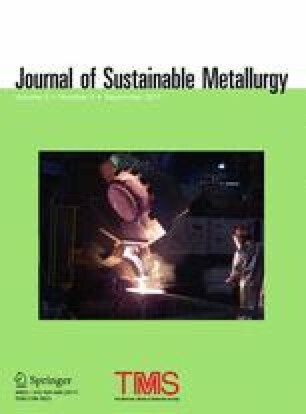 An especially interesting fact for this research is the very low distribution ratios (<10−2) of Fe(III) and Al(III) which were observed during extractions with 0.1 TODGA in n-dodecane from 2.9 M nitric acid, since aluminum and iron are expected to be present in the leachate produced . In 2015 at the Oak Ridge National Laboratory, Tennessee, a process with membrane solvent extraction was conducted comparing the extraction of REEs from a neodymium magnet leachate with Cyanex 923 and TODGA. With TODGA, Nd, Dy, and Pr were selectively recovered with no co-extraction of non-REEs such as Fe and B . Various organic diluents such as aliphatic/aromatic hydrocarbons, ketones, and high alcohols are used as media for dissolving the extractant. The interaction efficiency of organic diluents is mainly based on their polarity and hydrogen bonding affinity. They have a significant effect on extraction efficiency by providing solvation through hydrogen bonding and specific interaction with the extractable complexes. Their interactions can increase the hydrophobicity of the extractable complexes and become more stable in the organic phase, which results ultimately in the enhancement of extraction. Due to the important role of organic diluents in the extraction processes, studies on the aspects of their equilibrium data, kinetics of extraction behavior, and thermodynamic models are fundamentally required in order to develop and design extraction systems . In this work, various organic diluents were used to dilute TODGA. The aim of this work was to achieve good selectivity between the REEs and other exogenes in the leachate, and to examine the influence of diluents on selectivity of the REEs from one another. After extraction, stripping was performed to achieve a pure stream containing only the REEs. where [A]org and [A]aq are the equilibrium concentrations of the metal of interest in all its existing species in the organic and aqueous phase, respectively. D A and D B are the distribution ratios of the two metals compared . The hydrogen-decrepitated neodymium magnet material was received from the University of Birmingham in powder form (particle size 50–100 μm). The composition of the hydrogen decrepitated neodymium magnet material was determined after total dissolution in aqua regia at 80 ± 1° C. Experiments were done in triplicates. Aqua regia was prepared by mixing concentrated nitric (70%, ACS reagent, Sigma Aldrich) and hydrochloric acid (37%, ACS reagent, Sigma Aldrich) in the volume ratio of 1:3. Approximately 1 g of the hydrogen decrepitated material was completely dissolved in 10 mL aqua regia, 10% w/V ratio. The samples were treated for 1 h on a heating plate. The samples obtained were left to cool for 2 h and then filtered through polypropylene filters (0.45 μm VWR). The samples were further diluted with 0.5 M HNO3 (65%, suprapur®, Merck) for measurement with ICP-OES (ppm scale). No residues were observed on the filter. The leachate of the NdFeB powder was prepared by dissolving roughly 1 g of the powder in 50 mL of 4 M HNO3 (70%, ACS reagent, Sigma Aldrich). The powder leaching was carried out for 24 h at a temperature of 25 ± 1 °C on a magnetic stirrer. The leaching experiments were done in triplicates in polypropylene bottles secured with lids. Residues were noticed at the bottom of the vial after the leaching experiment. The residue was filtered through a polypropylene filter (0.45 μm, VWR) and further dissolved in aqua regia at 80 ± 1 °C for 1 h on a heating plate. The dissolved residue was then diluted with 0.5 M HNO3 (65%, suprapur®, Merck), and the solution content was determined by ICP-OES. This showed that only Ni was present in the residue, the element used in the coating of the magnet. The filtered leachate was also further diluted with 0.5 M HNO3 (65%, suprapur®, Merck) and analyzed with ICP-OES. A preliminary experiment was carried out with the model solution representing the leachate. The model solution was prepared from standard solutions of Nd, Dy, and Fe (LGC Standards, 1000 mgL−1). The model solution contained 21.49 mM Fe, 3.46 mM Nd, and 0.62 mM Dy in 0.1, 1, 2, 3, 4, 5, 6 M HNO3, to test the effects of nitric acid concentration on solvent extraction. The concentration of the nitric acid in the aqueous solution was determined by titrating with NaOH (0.1 M NaOH, FIXANAL). The aqueous phases were brought into contact with 0.1 M TODGA (>97% synthesized at Chalmers University of Technology and 2.0 g obtained by Karsruher KIT) in Solvent 70 (hydrocarbons C11–C14, ≤0.5 wt% aromatics, Statoil, Sweden). The organic-to-aqueous phase ratio was Θ = 1. The vials were shaken for 50 min, which was enough to achieve equilibrium  at a temperature of 25 ± 1 °C using a shaking machine (IKA Vibrax VXR Basic) with an adjacent thermostatic bath. The shaking speed was 1750 vibrations per minute. The phases were taken in 3.5-mL glass vials (46 × 13 × 0.8 mm) with polypropylene lids. All the experiments were done in triplicates and were centrifuged at a rotation speed of 2000 rpm for 1 min before sampling. The sampled aqueous solution was diluted with 0.5 M HNO3 and analyzed using ICP-OES. The filtered leachate obtained was diluted with 3 M HNO3 to achieve 4000 mgL−1 of the totally dissolved powder in the solution, and was used in the solvent extraction experiments. The concentration of HNO3 after dilution was determined by titration with NaOH (0.1 M NaOH, FIXANAL) and was determined to be 3.1 M. The concentrations of TODGA used were 0.01, 0.05, 0.1, 0.2, and 0.4 M. Solvent 70, hexane (95%, anhydrous, Sigma Aldrich), toluene (99.8%, anhydrous, Sigma Aldrich), cyclohexanone (≥99%, ACS reagent, Sigma Aldrich), and 1-octanol (≥99%, ACS reagent, Sigma Aldrich) were used as diluents for determining the optimal extraction conditions. All the organic phases were pre-equilibrated with an equal amount of 3.1 M HNO3. Pre-equilibration was done in order to minimize the phase ratio change, since some diluents are soluble in water. Pre-equilibration was also done to minimize the effects of other species in the solution, i.e., in extractants that extract acids . The phases were taken in 3.5 mL glass vials and were shaken using a shaking machine with an adjacent thermostatic bath. Shaking speed was 1750 vibrations per minute. All the vials were shaken for 50 min to assure equilibrium during the extraction experiments. The experiments were performed in triplicates and the uncertainties were expressed as ±1 σ. All the extraction experiments were performed at a temperature of 25 ± 1 °C. In all the experiments carried out, the organic-to-aqueous volume ratio was Θ = 1. Before sampling, the vials were centrifuged at a rotation speed of 2000 rpm for 1 min. The sampled aqueous solutions were diluted with 0.5 M HNO3 and analyzed using ICP-OES. The distribution ratios were calculated as mass balance, the concentration of the elements in the aqueous solution before and after the extraction. Stripping (back-extraction) was performed using 0.01, 0.1 M HNO3 (70%, ACS reagent, Sigma Aldrich), and MQ water as aqueous phases. The organic phases after extraction were separated from the metal-depleted aqueous phases. The volume of 5 mL of each of the organic phases after extraction were put in contact with the stripping aqueous phases for over 20 min in 20 mL shaking vials. The loaded organic phases used for stripping were 0.01 M TODGA in Solvent 70 and 0.1 M TODGA in hexane after extraction. A temperature of 25 ± 1 °C was used as well as Θ = 1. All the stripping experiments were done in triplicates. The sampled aqueous phases were diluted with 0.5 M HNO3 and measured using ICP-OES. Since the HNO3 acid extracted by TODGA was expected to be stripped back into the aqueous solution, the equilibrium concentration of HNO3 in the strip solution was determined by titration with NaOH (0.1 M, FIXANAL). The results of the total dissolution analysis are shown in Table 1. The sum is lower than 100% (around 95–97%) which is either due to a combination of experimental errors and our inability to measure elements such as O and N, which also make up a certain percentage of the composition of the NdFeB magnet. The results were in accordance with the literature values of the percentage of elements present in the neodymium magnet . A model solution containing 21.49 mM Fe, 3.46 mM Nd, and 0.62 mM Dy in different nitric acid concentrations was tested. The concentrations of nitric acid employed were 0.1, 1, 2, 3, 4, 5, and 6 M. The results are shown in Fig. 1. It can be observed from Fig. 2 that little extraction is obtained at 0.1 M HNO3. When nitric acid concentration was increased to 1 M, the distribution ratios for Nd and Dy increased dramatically, while the distribution ratios of Fe remained low. When the HNO3 concentration was increased to 2 M, the equilibrium distribution ratio values were reached for Nd and Dy, and these remained unchanged with subsequent increases in NO3 − concentration. The distribution ratios for Fe remained low throughout the whole range of nitric acid concentrations and did not exceed 0.4. Thus, extraction with TODGA was further carried out at nitric acid concentrations of around 3 M to ensure enough NO3 − counter ions for the efficient formation of the complex in the organic phase. From Eq. 3, it is clear that increasing the NO3 − concentration shifts the equilibrium to the right. The effect of diluent on extraction of the elements from a 3 M HNO3 solution was investigated. The diluents used were Solvent 70, hexane, toluene, cyclohexanone, and 1-octanol. The concentrations of the extracting agent TODGA were 0.01, 0.05, 0.1, 0.2, and 0.4 M in the listed diluents. It can be observed from Fig. 3 that the distribution ratios for Nd, Pr, and Dy increase with the TODGA concentration. Distribution ratios of the REEs increased with the concentration of TODGA in all the diluents, reaching values up to 1000 at the highest TODGA concentrations. The efficiency of the diluents decreases in the following order: hexane > cyclohexanone > Solvent 70 > toluene > 1-octanol. It can be concluded that the distribution ratios for extractable species decrease with the polarity of the diluents, with the exception of cyclohexanone, which has an active oxygen donor atom that has the ability to form complexes soluble in the organic phase . This, most probably, led to higher distribution ratios in this particular diluent. TODGA showed high selectivity of extraction of the REEs. It was observed that the distribution ratios for the heavy REE Dy were higher than those for the light REEs, which can be attributed to higher charge density of the heavy REEs due to smaller ionic radii, which facilitates the complex formation. The very high distribution ratios for REEs can be attributed to the strong oxygen donor atoms in the TODGA molecule. Since the concentration of the magnet waste in the investigated leachate was around 4000 mgL−1, at lower TODGA concentration saturation of the organic phase occurred. This fact did not allow to perform a slope analysis which can only be done when the metal concentration is negligible compared to the TODGA concentration. The distribution ratios of other elements in the leachate reached values less than 0.1. The highest distribution ratios were registered for B and Al in cyclohexanone, and reached 0.5. The higher D values could be attributed to the ability of cyclohexanone to extract these ions out of the solution by itself . The greatest advantage of TODGA in hydrometallurgical recycling of the NdFeB magnets is the very limited extraction of Fe by TODGA ligands, the element making the majority of the material, from nitric acid solutions. In a study by Zhu et al. , it was shown that divalent ions with ionic radii smaller than 80 pm and trivalent ions with ionic radii smaller than 70 pm show very weak extraction with TODGA in n-dodecane, which is in accordance with this study. The ionic radius thus plays a role in solvent extraction with TODGA, with REEs having larger ionic radii being prioritized in the extraction process. In the REE recovery process, special attention is given to the separation factors from which the number of stages needed to separate two elements can be deduced. The separation factors between the REEs and other elements were not calculated because none of the distribution ratios of the elements except the REEs reached a value above 0.1 (except for cyclohexanone). The focus was on the extraction of the REEs from each other. The separation factors between Dy (HREE) and Nd and Pr (LREE) were calculated, since Nd and Pr showed similar distribution ratios and Dy showed higher distribution ratios. The separation factors are shown in Table 2. The highest separation factors between Dy and the light REE were reached in 0.01 M TODGA in Solvent 70, at which concentration Dy was extracted selectively from other elements and the light REE. Very good separation between Dy and other elements is reached at 0.01 M TODGA in hexane and 1-octanol, but values as high as 14 are reached in other diluents as well. This can be explained with the fact that at low TODGA concentrations, it is now an ion exchange mechanism that is governing the extraction, where Dy substitutes for Nd in the organic phase. Very good separation factors for Dy are reached at at 0.01 M TODGA Solvent 70. REEs are extracted selectively and completely as a group at 0.1 M TODGA in all the diluents. Stripping was conducted with 0.01, 0.1 M HNO3, and MQ water. The organic phases chosen for stripping were 0.01 M TODGA in Solvent 70 after extraction for the recovery of Dy that was selectively extracted from the leachate, and 0.1 M TODGA in hexane where Nd, Pr, and Dy were extracted as a group. The organic phase after extraction was put in contact with an equal amount of the aqueous phase during 20 min by manual shaking at room temperature 25 ± 1 °C. The results of the stripping are shown as % metal stripped (Tables 3, 4). The stripping of the metals out of the organic phase after solvent extraction is crucial for the recovery of the metals of interest. Since TODGA is extracted at higher nitric acid concentrations due to high nitric counter-ion concentration, it is expected that the stripping will be achievable with less acidic media, or even MQ water. Stripping was therefore conducted with 0.01, 0.1 M HNO3, and MQ water. The recovery of the REEs reached almost 100% in MQ water for Nd, Pr, and Dy, while 0.1 M HNO3 performed very poorly, with only 50% of metals stripped. Incomplete recovery was achieved with 0.01 M HNO3. It was shown that only MQ water with no NO3 − counter-ions was enough to break the complex from the organic phase and achieve high stripping efficiency. A significant drop in the pH value 1 and less was observed after the stripping experiment. This indicates that the HNO3 extracted during the solvent extraction with TODGA was back-extracted into the stripping agent. No precipitation was observed in the aqueous phase after stripping. Neodymium magnets are composed of iron, neodymium, cobalt, dysprosium, and various other trace metals. This study was focused on selective extraction of REEs from other elements to achieve the best recovery possible. It was found that the concentration of nitric acid should be higher than 2 M for achieving highest distribution ratios for REEs. As expected, the distribution ratios of the REEs increased with the concentration of TODGA in all the diluents. The highest separation factors for Dy were achieved using 0.01 M TODGA in Solvent 70. REEs were extracted selectively as a group using 0.1 M TODGA in all the diluents, with the other elements not exceeding distribution ratios over 0.1 except for cyclohexanone, where the distribution ratios reached as high as 0.5. The stripping of these elements out of the organic phase was efficient using MQ water. This research received funding from the European Community’s Seventh Framework Programme ([FP7/2007-2013]) under Grant agreement no. 607411 (MC-ITN EREAN: European Rare Earth Magnet Recycling Network). This publication reflects only the views of the authors, exempting the Community from any liability. Project website: http://www.erean.eu.